I got a hint from Maddy (Magda Schmidtzau) about the upcoming exhibtion at La Maison D’Aneli. It opened on April 3rd and I visited on March 31st while Aneli was still working. The exhibtion shows the art from Bachi Cheng, Calypso Applewyhte, Madga Schmidtzau, RazorZ and Aneli Abeyante herself and an installation from Iono Allen & Theda Tammas. 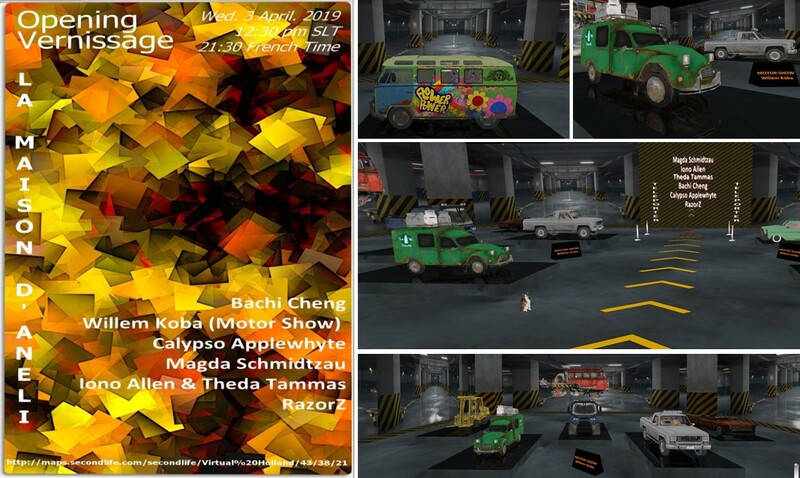 In the entrance hall there’s a motorshow presented by Willem Koba. Willem Koba is in Second Life for almost 12 years. He makes animated textures and mesh objects and runs a shop on the marketplace. At La Maison D’Aneli you see some of his motor vehicles in the entrance area. Calypso Applewhyte is a SL Photographer from France, who joined SL in 2010. Her focus is the avatar itself as a means of expression to transport emotions. She processes her pcitures with Photoshop. The result is really impressive! Maddy (Magda Schmidtzau), who gave me the hint for the early visit, joined SL in 2009. She’s a passionate photographer in RL and SL. 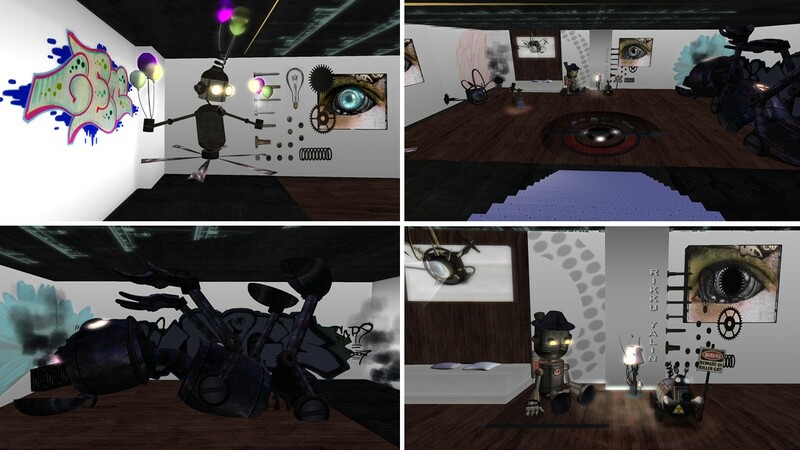 In SL she’s always open to new possibilities and experiments, she tries to convey the magic that i see. At La Maison D’Aneli most of her exhibits show portraits and pictures of avatars, and like Calypso her pictures transport a lot of emotions . It’s intriguing looking at them and to picture a story around what you see. RazorZ is in Second Life since 2010. He’s a builder and scripter and he makes sculptures. Like Willem Koba he runs his own store at the marketplace. 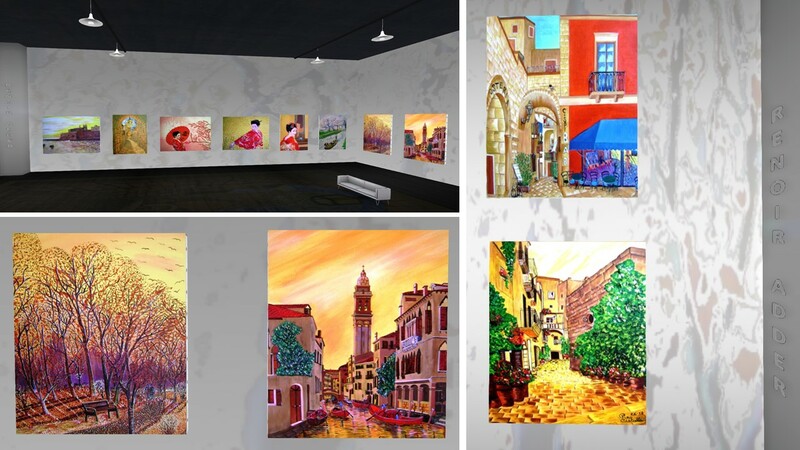 At La Maison D’Aneli his exhibition space is full of very colourful pictures. I think these pictures were taken in RL and processed to enhance the colourfulness quite exterme. This way the pictures are real eye candies and you see the underlying picture only on a second glance. In his section at La Maison D’Aneli are also some sculptures, again colourful pieces. It’s hard to decide where to look at first. 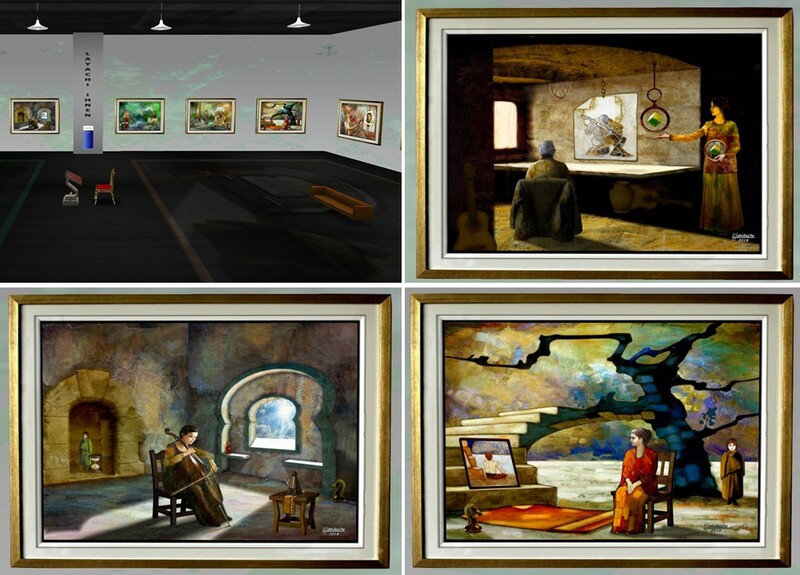 The pictures exhibited at La Maison D’Aneli are painted in RL and uploaded to SL. Sofi (Bachi Cheng) has an own website showing either stylised single persons or groups. Bachi’s style is unique. 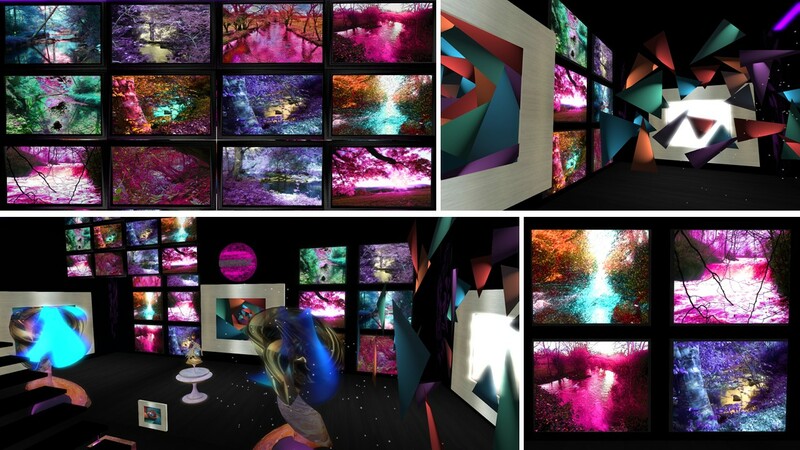 Last but not least one room at La Maison D’Aneli shows an installaion from Iono Allen & Theda Tammas named “Samurai”. You enter the room through a Japanese gateway. In the room itself you can sit on hoovering cusions and watch a film, Samurei that is shown on all walls of the room allowing you to full dive into it. The film was made with Second Life and is about 20 minutes long. 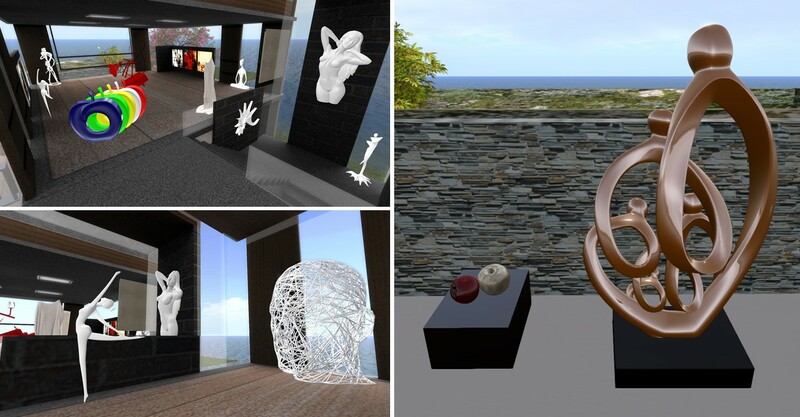 Quite fascinating what you can make with Second Life! In the room is also an animated avatar dancing. Just have a look :-). Theda Tammas is in SL amost for 12 years. She has had already some exhibtions of her work and it is not the first time that I see an installation of her (see Choreography of a Tortured Soul and Dissected Soul). 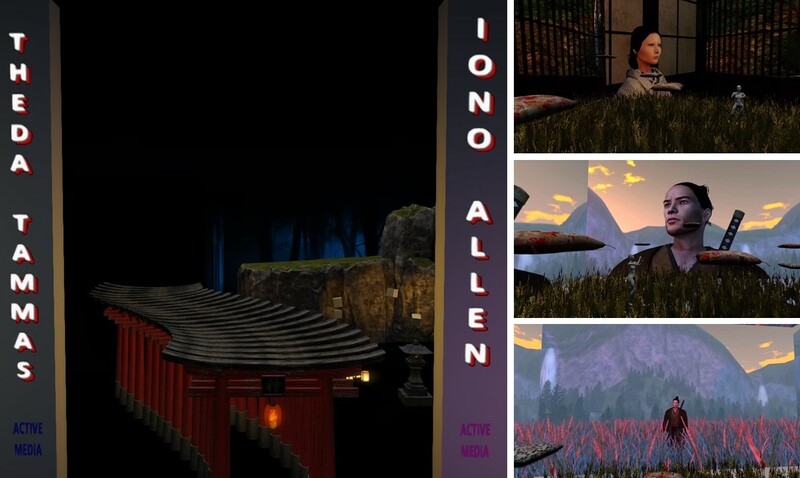 Iono Allen is also almost 12 years in SL and from his profile I conclude that his passion are making films. He has some links to films about Theda’s former installation in his profile, just look it up. He made the fil “Samurai”, that is shown in the installation. The film can be seen also on vimeo here. Thank you Aneli for another great exhibtion and thank you to all artists. Enjoy your visit – I did. When I visited the current exhibition at La Maison d’Aneli on February 28th (read Simploring 2019 (30) La Maison d’Aneli March) I came across Reycharles, who is one of the artists who’s work is exhibited at La Maison d’Aneli. “I’ve been in sl since 2012. I’ve spent a lot of my time traveling around this world. In the real world I work with digital and 3D graphics. I really like creating and manipulating to experiment with color and effect forms both in 2D and in 3D. 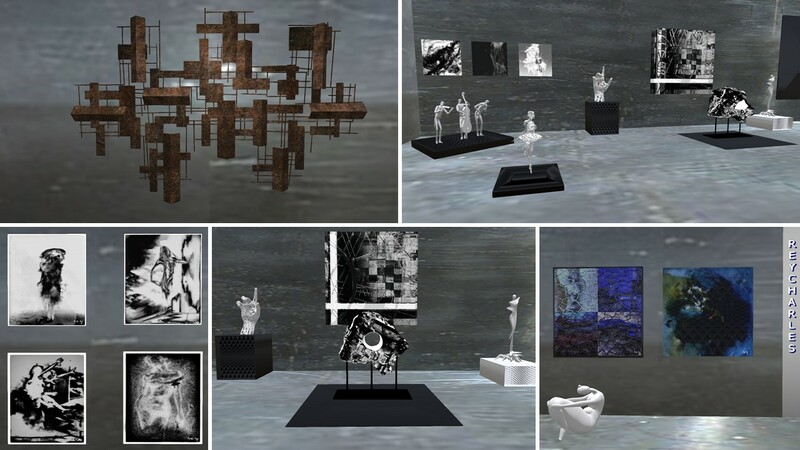 This is part of my work in the real world and I thought I’d bring it to SL too, so I’ve just started making exhibitions, I also have a gallery where I exhibit my artistic works, originals and reproductions. In particular Reycharles sculptures, be it human statues or geometric forms or fantasy objects caught my eye at La Maison d’Aneli and spontaneously I decided to visit “Rey’s Gallery” the very next day. 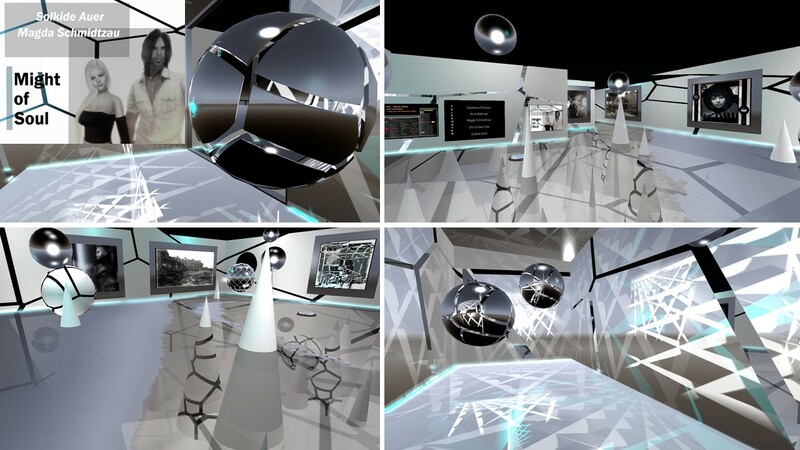 Rey’s Gallery is dominated by his 3D objects, his sculptures. The landing is at a court in front of the entrance to the gallery building – and the court is used as an extra exhibition area. Inside I found some of the exhibits from La Maison D’Aneli, like the hand with holes or the ballerina. But most of the objects were new to me. I was in particular intrigued by the “Yes and No” sculpture and by some of the stylised female bodies. As Reycharles predominantly makes scultpures in white or in one single colour the row of 5 apples in different strong colours on the 2nd floor is outstanding also. All of Reycharles sculptures can be purchased in Rey’s Gallery itself or at his store on the marketplace. I’m pretty sure, that I’ll come across his art again. For sure in my own garden as I purchased the “Yes and No” sculpture. I missed the opening of the current joined exhibtion at La Maison d’Aneli on Wednesday, 27 February, but I visited the day after. 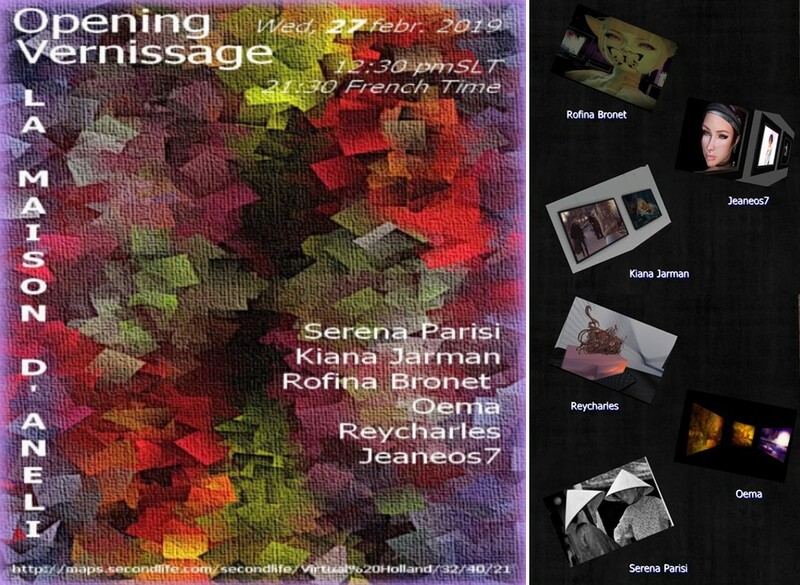 In March La Maison d’Aneli presents the work of 6 artists: Reycharles, Jeaneos7, Serena Parisi, Rofina Bronet, Kiana Jarman and Oema. 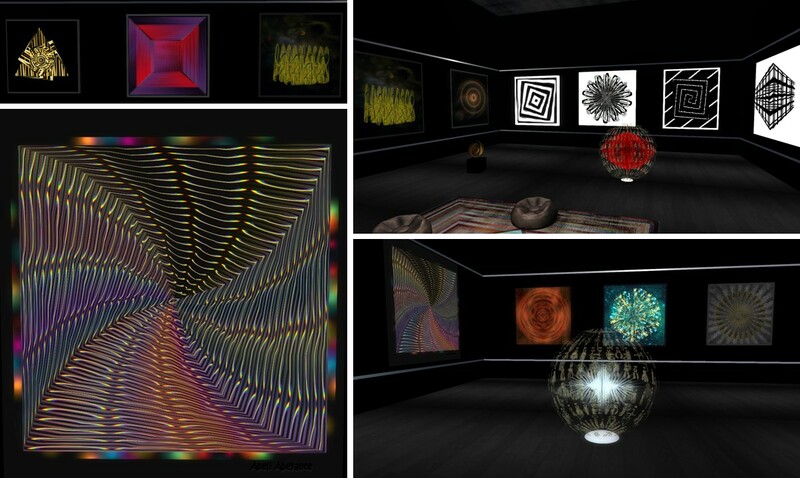 I started my tour through the exhibtion with Reycharles, who is in Second Life since 2012. In RL he works with digital and 3D graphics. He likes creating and manipulating to experiment with colour and effect forms both in 2D and in 3D – and he brings it to Second Life as well. Besides presenting his work in exhibtions, Reycharles also has an own gallery (here). 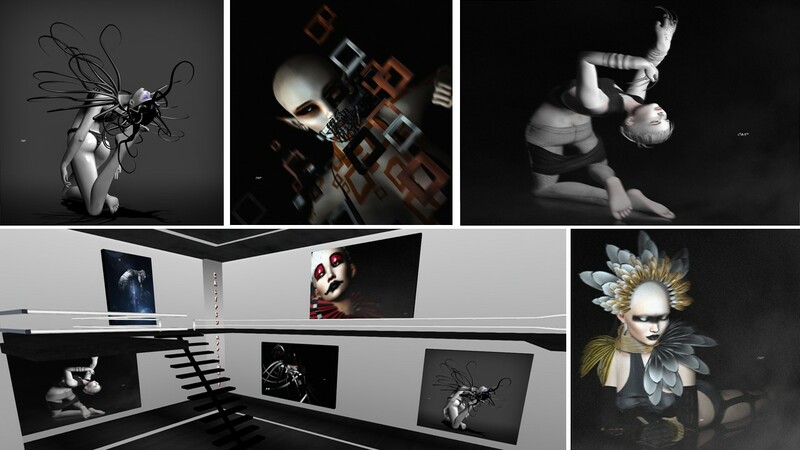 At La Maison d’Aneli we see a variety of 3 D scupltures together with graphics and get some insight into his work. 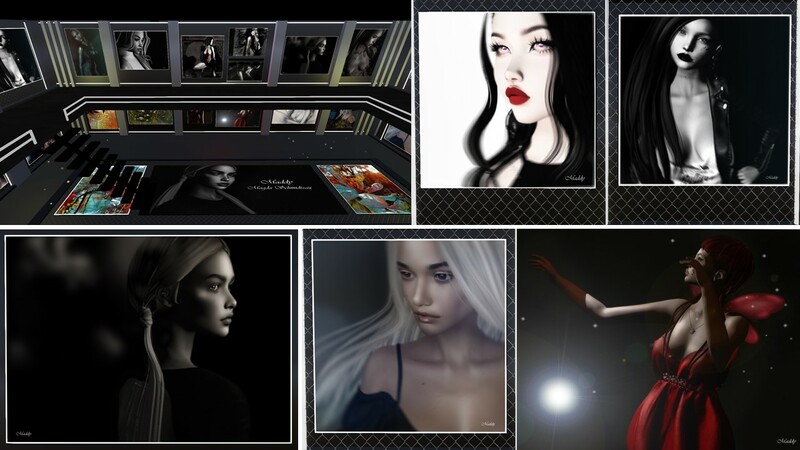 Jean (Jeaneos7) joined Second Life in 2016 and began making profile pictures of friends in 2018. Soon he opened a photo studio named J7Studios, that also serves as a permanet gallery nowadys. Besides portraits he also loves to take picture of beautiful landscapes. At La Maison d’Aneli we see an excerpt of his work. Serana Parisi describes herself as an explorer in RL and SL. Being in SL for more than 12 years, she still likes the joy, the simplicity, her friends of course and always to discover even more in SL (in this relation she’s like myself). The photography allows her to share her life. In the exhibition at La Maison d’Aneli she shows picture of her journey to Vietnam. She encountered people who’s smile and emotions intrigued her. She’s enthusiastic about the explosion of colours, which she thinks characterises this country. And her pictures serve as a proof that. Rofina Bronet is in Second life for 11 years and decribes herself as a dreamer, maker, thinker, crazy, charming, with inner fire, open mindeds and much more. Two years ago she started with videos and pictures, she mixed pictures and video material recorded in Second Life. 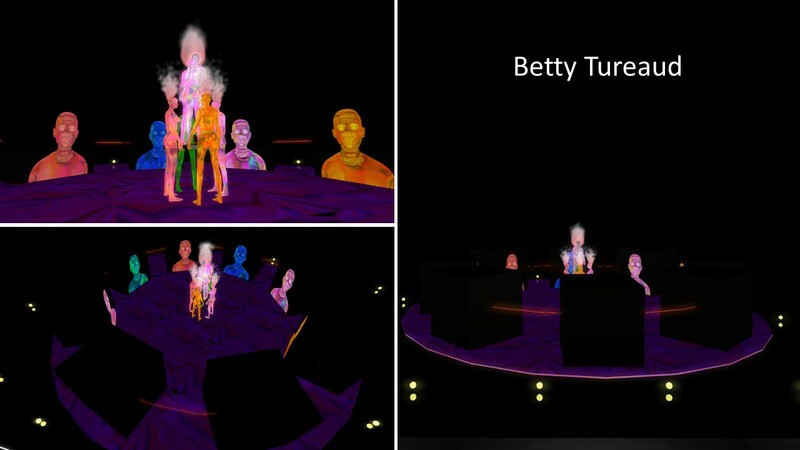 Her videos contain 3D effects, special effects and supports the music and art scene in Second Life. At La Maison d’Aneli you can watch her video of art installations of other artists like Bryn Oh or from festivals and other events. Besides that you see related pictures of these installations and events. Kiana Jarman also joined Second Life 11 years ago. She simply loves to take pictures in Real Life as well as in Second Life. She says: “Photography is like writing with light, making music with shades, such as paint with time and seeing with love“. The pictures exhibited at La Maison d’Aneli transport a lot of emotions. You can sense the passion that went into creating them. Oema is quite renowed as an artist in Second Life. I visited her sim Enchanted Art back in 2017 where Oema presented not just her art (read Simploring 2017 (34) Enchanted Art). Enchanted Art is no longer existent. Oema said about herself “I am an artist, an art curator, an art blogger and a magazines writer … so I am an art passionate:-). Art is a very important part of my life, one of the best ones“. The exhibition at La Maison d’Aneli shows the broad spectrum of Oema’s art. 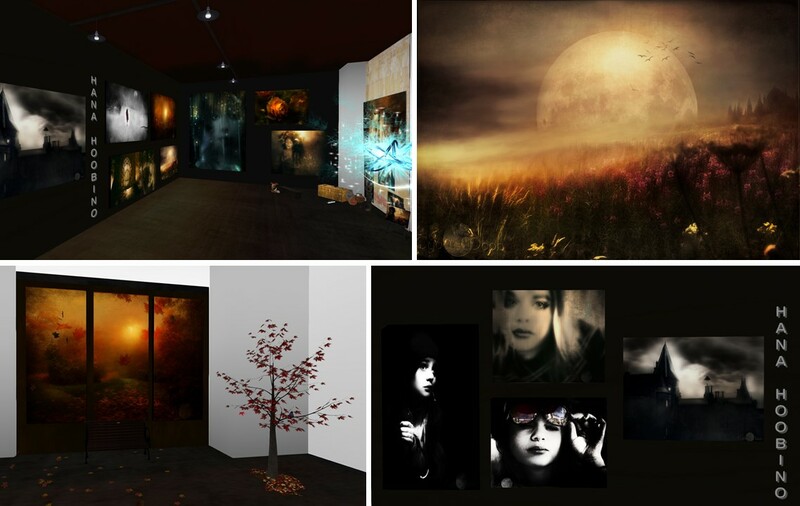 She loves virtual landscapes, she tries to make them look realistic and she loves surreal art. At La Maison D’Aneli her pictures are shown in a dark environment, that gets a mystic atmosphere by moving sparkles of lights. 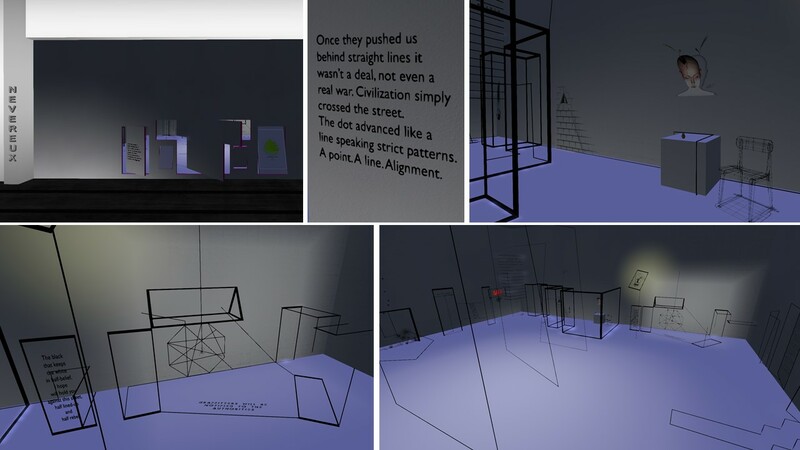 Oema also writes about art in her blog Virtuality. Thank you for this new joined exhibtion, Aneli. And thank you to all artists. It’s really worth a visit. I got the invitation to visit the newest exhibition at La Maison d’Aneli, that opened January 23rd and features the art of: Therese Carfagno, Eupalinos Ugajin, Nabrej Aabye, Betty Tureaud, Tubal Amiot and Xirana Oximoxi. 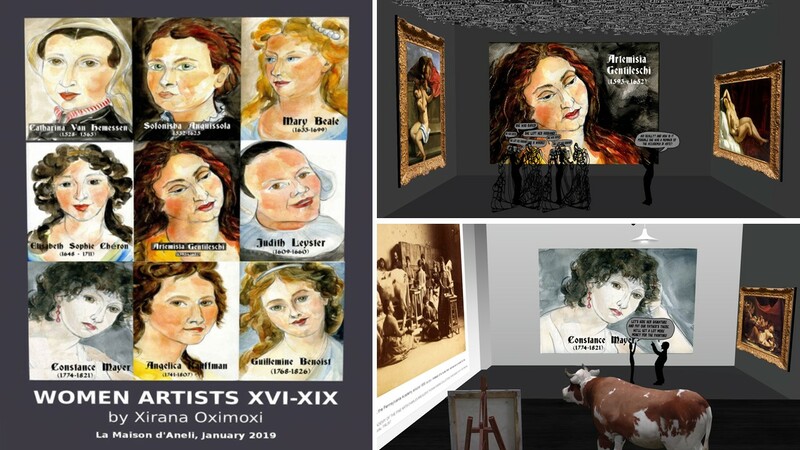 Xirana Oximoxi (Nuria Vives)’s exhibition at La Maison d’Aneli shows a series of nine women artists of 16th – 19th centuries centering the attention to the difficulties they had to deal with to be recognised as professional artists. Each of the female artists has her own little corner. Stylised men are looking at the exhibited pictures and are discussing, you see their comments like in a comic strip, the ceiling hanging full of other bubbles. To some extent the comments seem to be funny nowadys, but on the second glance they left me very pensively. 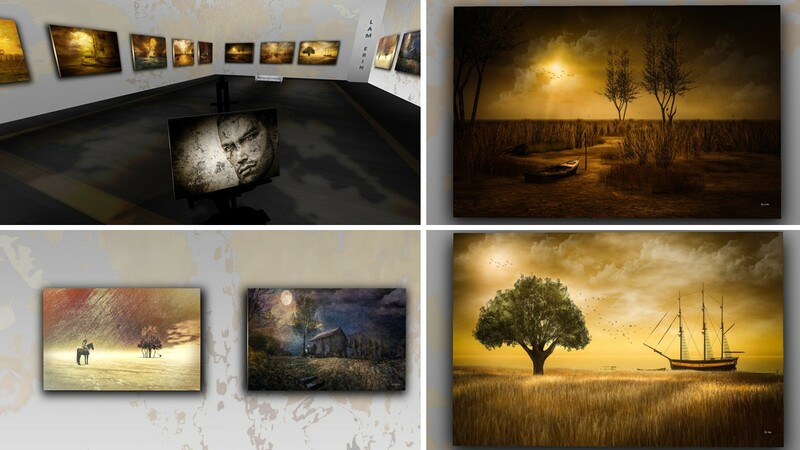 Nabrej Aabye is a digital artist. His work ranges from simple illustration, photography, video, design, digital painting, typography and to mixed art. At La Maison d’Aneli you’ll get an impression of the variety of his art, that is not dominated at all by one style. The two boule balls and the sci-fi skeleton of a dinosaur show examples of his 3D art. 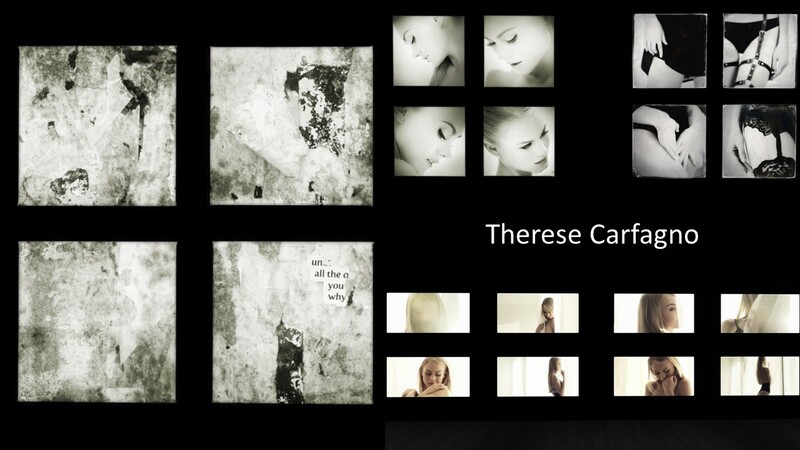 Therese Carfagno is Second Life for 12 years now and took pictures within SL for many years. Lately she’s more interested in pictures of real life. In her exhibition at La Maison d’Aneli she shows a series of pictures of Nancy, “a very kind and beautiful girl who’s very at ease in front of the camera.” There’re also a few abstracts. You’ll have to interpret them yourself as even Therese can’t explain what it is – nor can I.
Tubal Amiot’s usual name is Aïcha according to something in her real name. Like Therese Carfagno she’s also in Second for almost 12 years now. She says about herself, that other people find her being eccentric. For her SL is a place to do what she doesn’t do in real life. She’s first of all a poet and writer. Tubal makes paintings with softwares, sometimes 3 for one painting. The work exhibited at La Maison d’Aneli reaches from naive art to adult art, from scuptures to comics, from abstract to garphical pictures. And it’s really colourful! 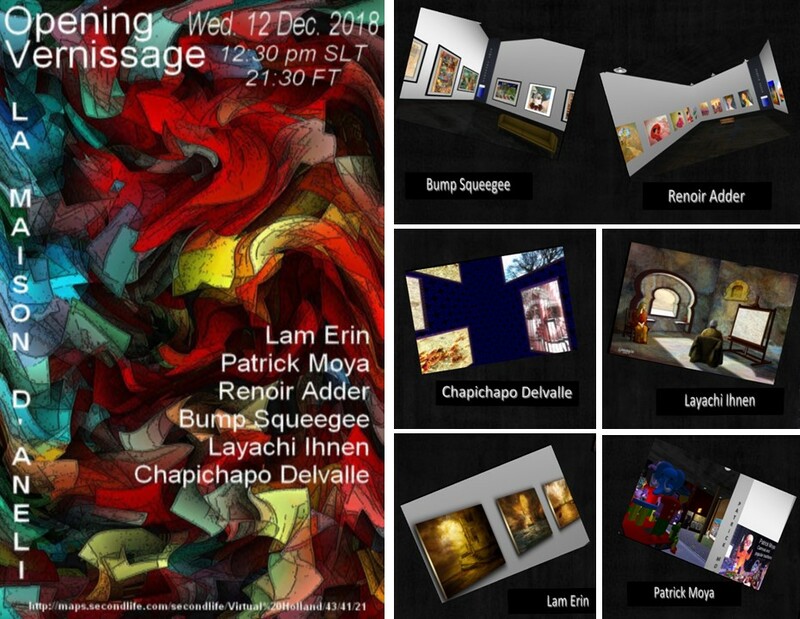 Once again Aneli Abeyante has put together an impressive exhibtion showing the broad variety of art in Second Life at La Maison d’Aneli. I did enjoy my visit and can only recommend that you’ll have a look at it. Thank you Aneli and thank you Therese Carfagno, Eupalinos Ugajin, Nabrej Aabye, Betty Tureaud, Tubal Amiot and Xirana Oximoxi. The latest exhibtion at La Maison d’Aneli opened on December 12th and will stay open for the public until mid of January 2019. It presents gives insight into the art of Patrick Moya, Lam Erin, Chapichapo Delvalle, Layachi Ihnen, Bump Squeegee and Renoir Adder. 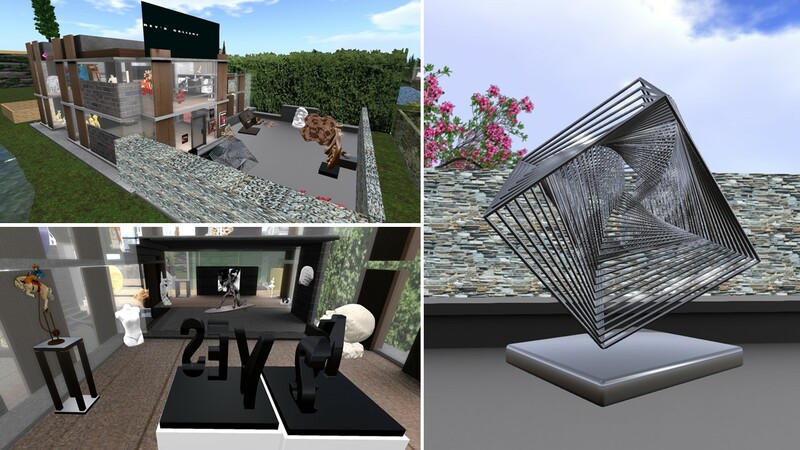 I started my visit on December 16th, with the corner presenting Patrick Moya’s art, which provides an impression of Patrick Moya’s (moya janus) art in Second Life and in Real Life. I came across Patrick Moya in 2017 when I visited his Moya Land (read Simploring 2017 (56) Moya). Patrick Moya (born 1955 in Troyes, France), is a French artist. He is a part of the artistic movement “Ecole de Nice”. Moya has been at the forefront since the 1970s of straddling the latest forms of media and technology to benefit art rather than rendering it extinct. He is an early pioneer of video art and is active with his art in Second Life since 2007 in addition to his work in the physical world. The barriers between the two worlds do blur in his artistic work. Moya Patrick (moya janus) has also a website with tons of information about his work and about Moya in Second Life. Unfortunately it is in French only. a. “Realism”: the pics of landscapes and avatars for which such effect is used, look “real”. At La Maison d’Aneli Liam presents pictures that were processed to look like paintings. I personally think that these pictures are great examples to prove how the virtual and physical world are more and more interlocking. chapichapo Delvalle is a French artist and he’s connected to Patrick Moya. The exhibtion at La Maison d’Aneli has two parts. First there’re the pictures. Some of them look like pictures taken in real life, some others seem to be processed pictures taken in Second Life. Honestly, I can’t tell. What I can tell is that they are artful and intriguing. The second part of chapichapo Delvalle work can be accessed by the stairs in his exhibition area. chapichapo Delvalle makes moving colourful spirals and kaleidoscopes and there’s also a room where you can literally walk into a kaleidoscope. You can see more of chapichapo Delvalle work on flickr here. Layachi Hamidouche (Layachi Ihnen) is an artist from Algeria, born in 1947, hence he’s over 70 years old. Although he’s for sure not a native digital he began to work with computers and integrated digital elements into his work since 1999. 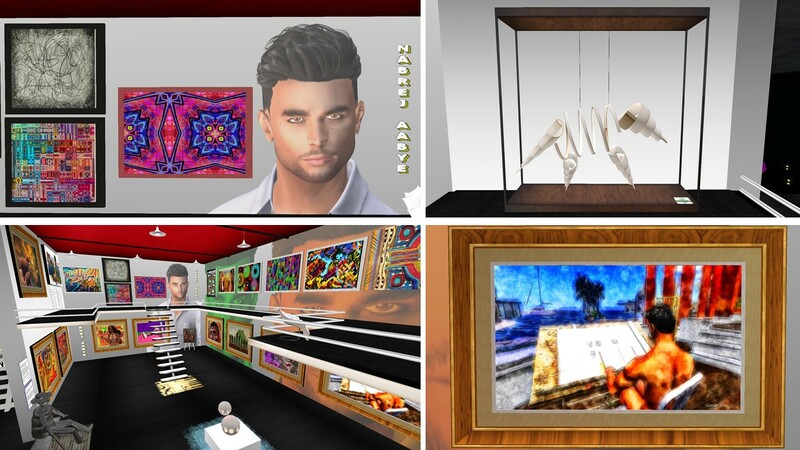 He also runs his own gallery in Second Life LAYACHI ART GALLERY. His website is in French. And he is connected to Patrick Moya (moya janus) as well. The pictures presented at La Maison d’Aneli look like ancient paintings on the first view, but there’s a lot to discover in them if you look at them in more detail. Bump Squeegee is an artist and retired art educator from Oklahoma, USA. His work has numerous received awards and has been shown in galleries and museums in Boston MA, St. Louis MO, Los Angeles CA, Lincoln NB, his native Oklahoma, as well as numerous online exhibitions and across the SL grid (information from the provided notecard at the exhibition). At La Maison d’Aneli he presents digital assemblages, that are derived from a number of sources like scans from old books, magazines, the web, as well as scans of original photos and drawings. And the result are pictures in which you will discover new elements each time you look at them – intriguing! “Vangogh Rembranch is an artist who deserves a special place: it is a longtime friend and a generous supporter of our charity project ‘Harambee Gwassi-Kenya’ and he often dedicates the sales of his paintings to support our Schools project! His paintings are real works“. I couldn’t find out more about the artist so far and the website that was provided didn’t work. But I can say, that the work presented at La Maison d’Aneli is worth looking at. Some of the pictures have an Asian touch, some are clearly impressions of the Mediterrean. When you compare these pictures, that are taken from real paintings according to Renoir Adder with the digital “paintings” presented by Layachi Hamidouche (Layachi Ihnen) or Lam Erin it is hard to tell what’s real and what’s digital. Thank you for this new joined exhibtion, Aneli. I enjoyed my visit a lot again. 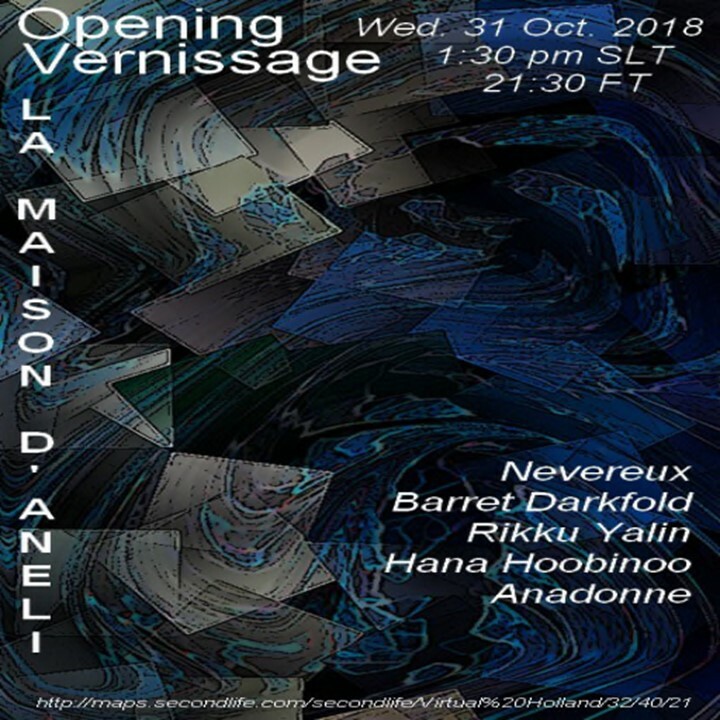 On October 31st, a new joined exhibition of 5 different artists was opened at La Maison d’Aneli. This time it features the art of Nevereux, Cybele Moon (Hana Hoobinoo), rikku Yalin, Barret Darkfold and Violaine (anadonne). And once again the mixture of different art is quite facinating. 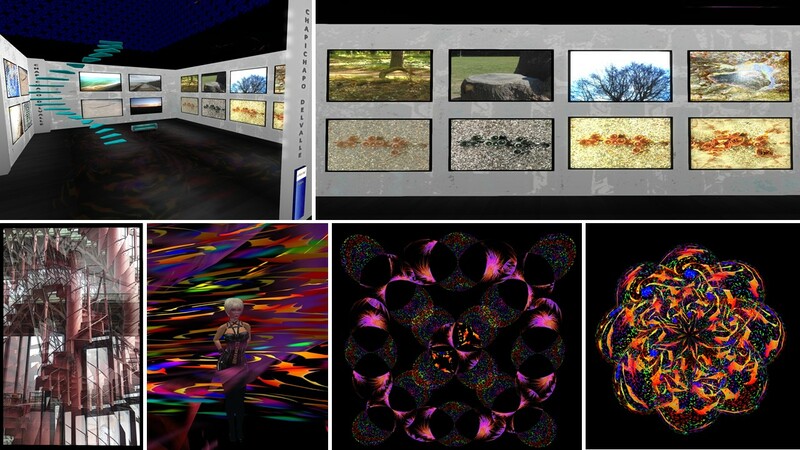 Cybele Moon (Hana Hoobinoo) is offers a mixture of photographs taken in the physical world on in virtual worlds. With some pictures it’s hard to distinguish where they were taken, or are the mixed? I liked in particular the Autumn picture with a tree loosing it’s leaves in front of it. Each of Cybele’s pictures seems to tell a story, that you have to make up yourself. The protraits are attracting, at least I wanted to know more, and again I can make up my own story. Cybele has an own blog, that you might want to look up. rikku Yalin’s art is a mixture of 3D and 2D, the objects seem to be built from scrap, they are to some extent funny. They interact with the 2D pictures displayed at the walls, be it graffiti or be it screws, nuts and gearwheels. Looking at the details is very interesting and at least my thought was that it all shouldn’t be taken too seriously. I just enjoyed exploring rikku’s art. 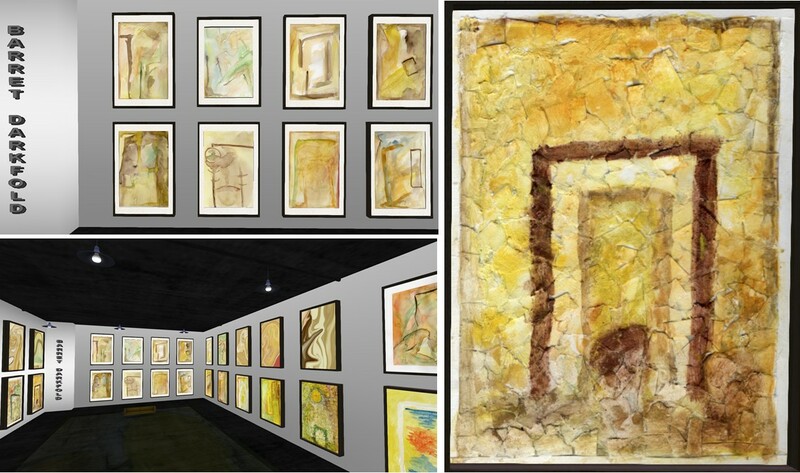 Barret Darkfold, in RL known as David Aran Brugues, is an abstract painter from Catalonia working with techniques like watercolor, oil, acrylic, mixed, encaustic, and digital art. At La Maison d’Aneli he presents paintings with the colour Yellow. On a frist view they might look all similar, due to the amount of pictures on the same size, but looking closer at them you see that each of them is unique and as they are abstract you may interpret them yourself. David Aran Brugues has also his own website, if you understand Spanish (I don’t) and are interested to see more of his art. Violaine (anadonne) shows variations of RL photographs, abstract pictures and watercolour. The pictures are grouped, 4 variations of a picture or scene each. They are clearly connected with each other and tell a story or offer a different point of view. I for my part can’t categorize her art. I think she’s playing with different forms to express herself. Thank you for another great joined exhibtion, Aneli. This joined exhibtion at La Maison d’Aneli is open until November 25th. I enjoyed my visit and it inspired me. At La Maison d’Aneli a new joined exhibition of 5 artists has been opened on Wednesday, September 26th. It features the art of: ChrisTower Dae, Solkide Auer & Magda Schmidtzau, Kirle Adamski and Dantelicia Ethaniel. All artists have a different focus which makes the exhibition varied and enjoyable. When you enter La Maison d’Aneli you get a folder offered which contains some information about the artists. I used some of this information in my following text. 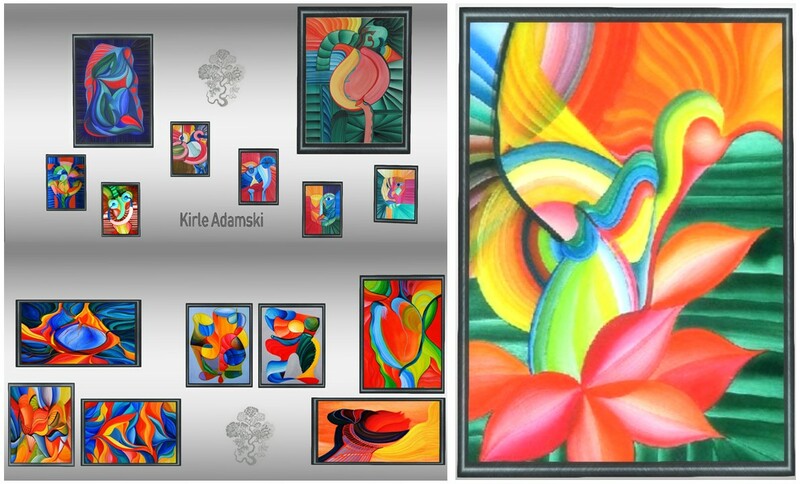 Kirle Adamski, is a selftaught artist from Denmark who started painting in 1997 and had her first exhibition in Denmark in 2000. Kirlie expresses herself in strong colours. She says that she never decides a motive before painting, there’s no plan, in the end the painting expresses herself at the time it was made. Kirlie’s paintings are in watercolour and copied from RL paintings. 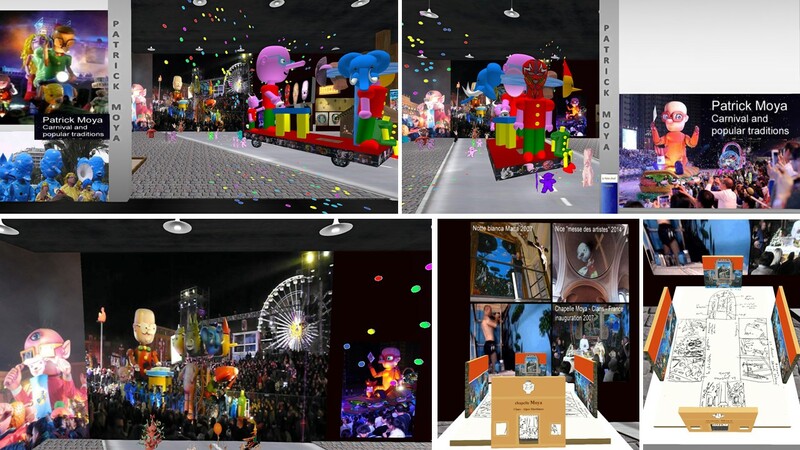 She had several exhibitions in RL as well as in SL. 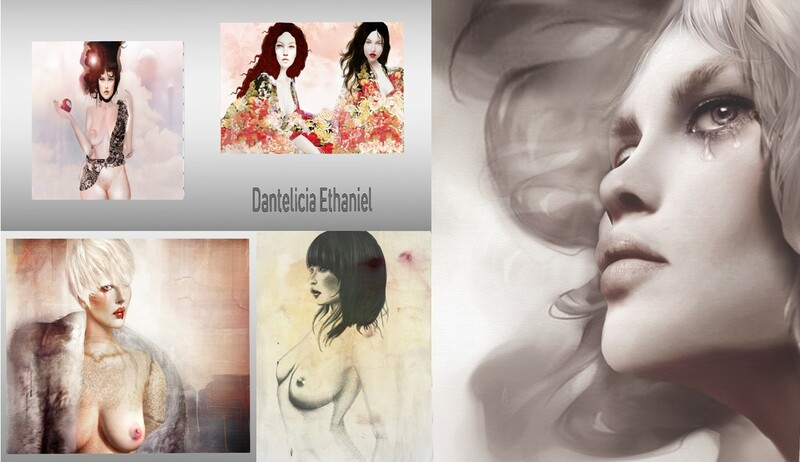 Dantelicia Ethaniel is a French plastic artist and fashion designer in first life, Dantelicia has embraced the virtuality of Second Life almost 10 years ago. She got passionate about SL photography early on and uses it to create a bridge with traditional painting effects such as water colors or acrylic she practiced in her everyday life. Solkide Auer tries to express his ideas through different sculptures. He started creating geometrical shapes then used more difficult techniques such as “the shade”, which gives the possibility to manipulate a unique prim in a very complex way. As a result he obtained unexpected and different shapes quite unlike the ones anyone can find around. 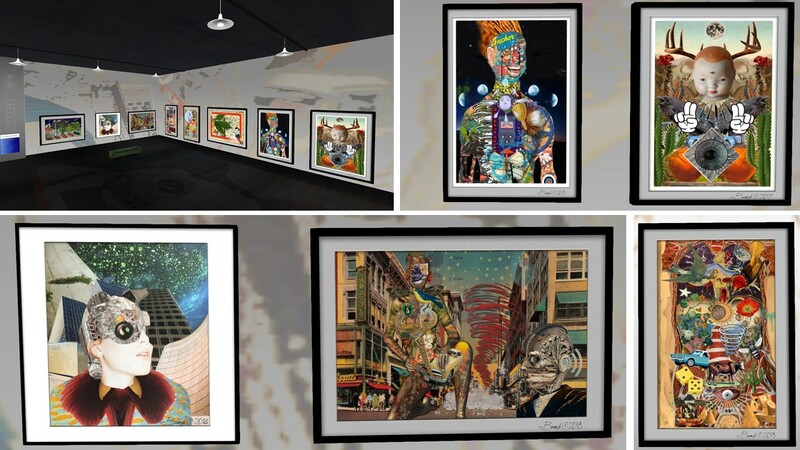 Solkide Auer’s art has been exhibited at several galleries and museums within SL but he has also transfered his art into RL exhibitions be it printed or be it shown as 3D on monitors. 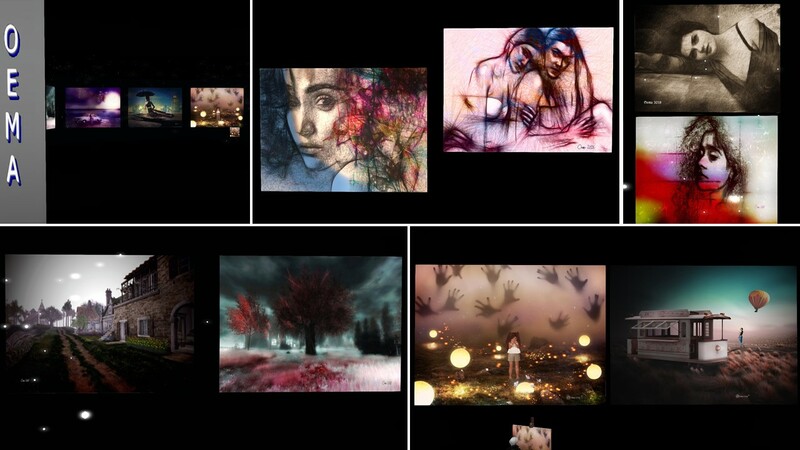 At La Maison d’Aneli Solkide’s art work is part of an exhibition named “Might of Soul” that features pictures of Maddy (Magda Schmidtzau) who is a passionate phortographer in RL. 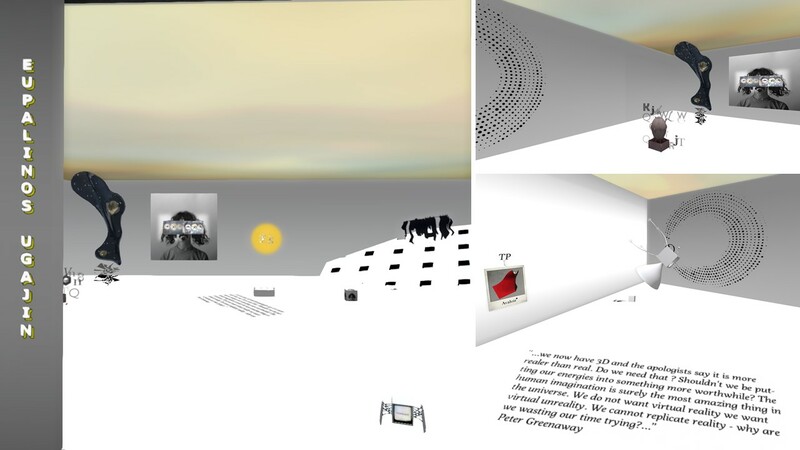 In Second Life she plays with the possibilites of this virtual world and tries to convey the magic that she sees. Maddy had already quite a lot exhibitions within SL. 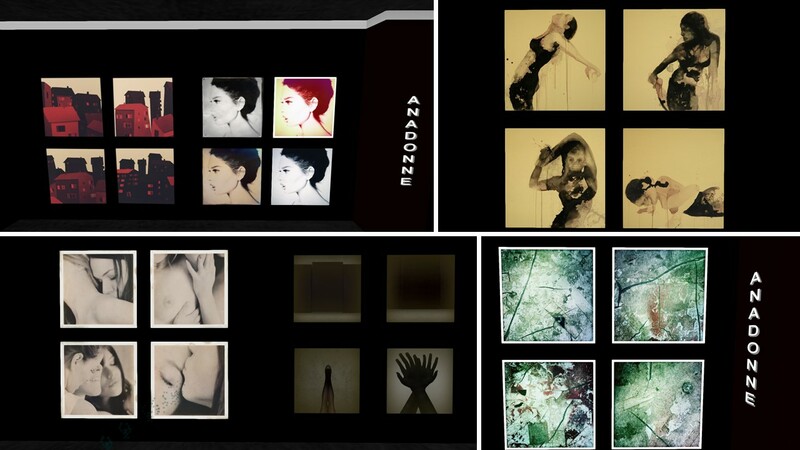 Maddy’s pictures exhibitied at La Maison d’Aneli are both, RL pictures and artificially processed pictures taken in Second Life. The combination of Solkide’s geometrical shapes and shades with the pictures of Maddy makes this exhibtion unique. ChrisTower Dae is an Italian photographer. Chris shows at La Maison D’Aneli portrait pictures taken in Second Life, mainly female. The pictures impress by their perfection as well as by the facial expression. 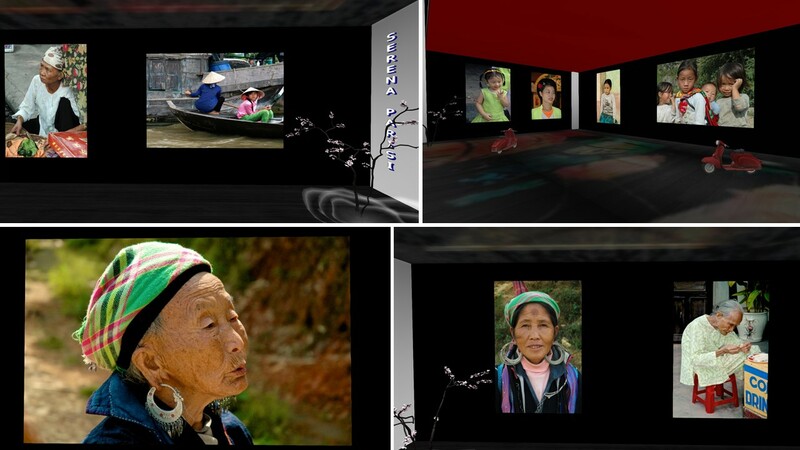 The avatars have a unique soul and the viewer can sense the emotions transfered with the portraits. Chris places the face mostly at a side of his pictures, not showing the whole head which might contribute to the facination of the portraits. Thank you for this great joined exhibtion, Aneli. I enjoyed my visit a lot.